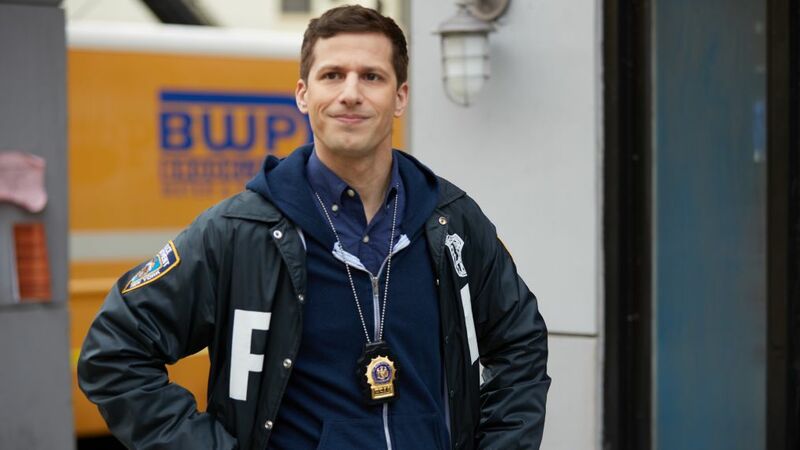 The goofy cop-com takes aim at a serious matter when Terry (Terry Crews, above right) is racially profiled by a white cop—but star and executive producer Andy Samberg (above left) promises this isn’t a case of the Nine-Nine going grim. Balancing comedy and social issues is tricky. What can you tell us about the episode? I don’t want to talk about it too much because I don’t want to put expectations on it. People should just see it and talk about it. But I will say, we were very conscious of not changing the DNA of our show. We were gonna talk about issues like that, but not have it be too super dramatic. Will Gina survive her face-off with the MTA? Can Nathan Fillion get Jake to geek-out? The star and EP spills the deets. So this isn’t a very special Brooklyn Nine-Nine? There’s still a lot of laughs in it. I personally love the episode. I think it came out really wonderful, and I’m glad we did it. Did you feel that, because you’re a cop show, this needed to be addressed in some way? I don’t think it was our obligation, necessarily, but we talked about it a lot [and decided] let’s not do it unless we feel like it’s the right angle and it feels natural. There were a few versions that were tossed around and the one that we came up with felt like a really nice fit.